Metrolinx conducted the Yonge Relief Network Study (YRNS), in cooperation with the City of Toronto, TTC and York Region, in order understand the crowding on the TTC’s Line 1 Subway and develop options to address it. The study found that planned and funded projects, such as Regional Express Rail (RER) and Automatic Train Control on Line 1 will significantly reduce crowding on the subway and help accommodate new growth until around the year 2031. However, as growth continues past 2031, a new transit project that can relieve demand on Line 1 will be required in order to maintain the resiliency and effectiveness of a transit network that can continue to support growth. The study reviewed short, medium, and long term options, developed from a long list of over 150 project concepts. No individual short or medium term option could address long term crowding, however it was found that a combination of the options may delay the need for a major new infrastructure investment. Long term options, including a surface LRT, four subway configurations, and improvements to RER were developed and tested using the Metrolinx four-chapter business case framework. This analysis concluded that the current transit expansion program will significantly shift demand from Line 1 but that further improvements to the northern GO lines will likely offer little additional relief to Line 1. The LRT option, despite being lower cost, was found not to have significant crowding reduction potential. It was determined that a new subway option, which may be tunnelled or use surface running alignments/legacy infrastructure, would be the most effective solution for long term Line 1 crowding. Lester B. Pearson International Airport and the surrounding area are home to the highest concentration of jobs in the Greater Toronto and Hamilton Area outside of downtown Toronto. Pearson Airport itself employs about 35,000 people, while the surrounding area has about 245,000 jobs. This activity results in high traffic volumes and unique travel patterns, however, transit use to, from and within this area is low. “High-order transit connectivity to the Pearson Airport district from all directions,” including a fast transit link to downtown Toronto, is one of nine Big Moves in the Regional Transportation Plan. Metrolinx has completed a Transportation Study of the Pearson Airport Area in collaboration with municipal and transit agency partners. The Study evaluates the current and future transportation needs of travellers, airport employees and employees of local businesses in the surrounding area, and aims to provide solutions that will improve the transportation network that serves this area. The full report available in PDF upon request. 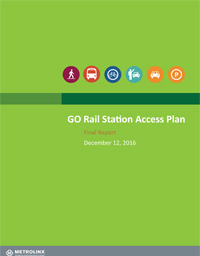 With the population, employment growth and expansion of GO Rail service, the passenger traffic at Union GO Transit Rail Station is expected to increase by two to three times 2006 passenger volumes by 2031. To accommodate this, Metrolinx has considered options to provide alternative routes into downtown that could divert passengers from Union Station, and limit the amount of additional infrastructure and space required. Option 4B: Bathurst North Yard plus modified Downtown Rapid Transit. This option includes a Downtown Rapid Transit line that connects the Bloor-Danforth subway and Bathurst North Yard. GO Kitchener, Barrie and proposed Bolton GO train services would then terminate at Bathurst North Yard. Passengers would transfer to the Downtown Rapid Transit to further their trips to downtown Toronto. Option 6B: Lakeshore GO tunnel to new station adjacent to Union station. The Lakeshore East and West GO train services would travel underground as they approach Union station, and connect in to a new underground GO station, located east of the existing Union station. The Union Station 2031 Demand and Opportunities Study will help to inform further analyses on any future downtown rapid transit expansion. Please note that this study was completed in fall 2011. Metrolinx completed the Bolton Commuter Rail Feasibility Study in 2010. The study is a comprehensive review of the technical requirements to implement a commuter rail service between Bolton (in the Town of Caledon) and the City of Toronto. The study determined that implementing rail service between Caledon, Vaughan, and Toronto was feasible, but that ridership would be modest and capital cost would be high, and did not recommended moving forward with the expansion in the short term. On February 12, 2013, the Metrolinx Board of Directors approved a technical update to The Big Move which included moving commuter rail service to Bolton from The Big Move’s 0-15 year plan to its 16-25 year plan, incorporating the findings of Bolton Commuter Rail Service Feasibility Study. Commuter rail service to Bolton remains in Metrolinx’s long-term plans.